Stern, 35, is an archaeologist and an assistant professor in the history department at Brooklyn College. Her passion is the tomb graffiti of the ancient Jews in what was then Roman Palestine. Graffiti has been "published, but sort of disregarded," she says. "Whereas I think it is intimate, vocal and spontaneous, and adds to the historical record." An expedition to the Southern Galilee a few hours north ends at the site of one of the country's richest burial sites: Beit She'arim. It is both national park and necropolis; a city of the dead dating back to the first century. There are more than 30 excavated tombs here. "It's amazing that what can seem like hills and fields is standing over the largest concentration of burials from the Roman and Byzantine periods in the entire region," Stern says, while standing on the hillside. Jewish people came to live or be buried here from all over the ancient world, according to Beit She'arim manager, Revital Weiss. "We have a burial place from the Lebanon community, from Syria — the farthest one is from Yemen," Weiss says. 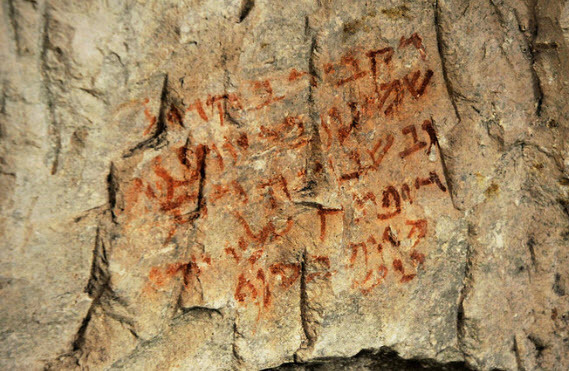 A painted inscription above a burial space in Beit She'arim is written in Aramaic and translates to: "The one who is buried in this [place] is Shim'on, the son of Yohanan; and on oath, whoever shall open upon him shall die of an unfortunate end." Jews were exiled from Jerusalem after a revolt in A.D. 132. Beit She'arim, established by a fabled Jewish rabbinical prince, Judah, became a refuge for him and his followers. Weiss leads the way to a particularly large and rich tomb called the Cave of the Coffins. Sarcophagi are not a Jewish tradition, she notes, but in Roman times Jews believed if they copied the Romans, talked like the Romans, behaved like the Romans, they might have a better life. Christian and pagan influences also are mingled in here. It's in the Cave of Coffins that Stern points to two inscriptions in ancient Greek. They are tiny and clustered near niches once holding oil lamps. One says, "Take courage, Holy Parents of Pharcitae, udes adonitas — no one is immortal." Stern explains that the dead who are being brought into the catacombs shouldn't feel that they are weak just because they've passed on. She reads aloud the other inscription: "Good luck on your resurrection." "Of course, resurrection is not in the Jewish tradition," says Emma Maayan Fanar, a professor of Byzantine art at the University of Haifa, who has teamed up with Stern. "It's very uncommon." Tiny menorahs are scattered as engravings throughout the tomb, a symbol of the Temple in Jerusalem and a symbol of the endurance of the Jewish faith. There are magical spells in Greek. There are also curses in Aramaic that threaten a bad fate to the tomb robber. Those seem to have been ignored, as only the graffiti and heavy stone coffins are left. In the dark, the effect — particularly in these tiny messages — is to hear the dead speaking. It's peaceful, but lively. One gets the sense of a giant Facebook page of the ancient world. "They were grapho-maniacal," Jonathan Price, head of the classics department at Tel Aviv University, says of the ancient Jews who were entombed here in the first and second centuries. Over the next decade, Price and a group of scholars plan to publish many volumes of inscriptions from walls, pots, glass — everything but books — dating from the time of Alexander the Great to that of the Prophet Muhammad. They will include many languages, such as Hebrew and Aramaic dialects like Syriac, Nabatean and Samaritan. Price describes the graffiti as "a spontaneous verbal outburst" that adds intimacy to the historical record of the ancient Levant and Mesopotamia. "These cultures wrote everything," he says. "They recorded their personal lives, their public lives; empires recorded themselves. They were hyperlinguistic." Israeli archaeologist Boaz Zissu is another fan of this "micro-archaeology." He, too, thinks tomb graffiti has been neglected and is eager to work with Stern. An archaeologist at Bar-Ilan University, he drives his battered Jeep out to the Judean foothills south of Jerusalem. This area is honeycombed with tombs, too. 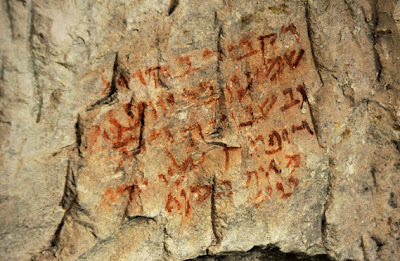 Zissu wants to show Stern a cave he'd discovered — and not seen since 1998 — after finding a bit of tomb graffiti while surveying for the Israeli antiquities department. But the cave, at the bottom of a Byzantine quarry in a scrub of high desert, is not visible. A rugged man in his 40s, Zissu had to find a lonely fig tree that marked the site. Figs were often planted near tombs to give mourners nourishment. When he found it, he dragged a spindly 25-foot ladder out of the Jeep and pushed the ladder into the quarry. At the bottom lay the rock tomb from the first century. There was also a tarantula. It didn't bite. "OK," he says to Stern. "Your goal is to find the graffiti." Zissu meant his own, previously published inscription. But within moments, Stern had found graffiti he'd overlooked back in 1998. Several lines long, it was almost impossibly small and couldn't really be photographed without raking infrared light over it. But there it was. "This is exciting," Stern says while whipping out her notebook. She tries to make out the inscription, but it is in scrambled Greek letters, including T-h-e-o-s, or God, written backward, most likely because it is a magical spell. Before leaving, Stern and Zissu point to some small net designs that look like Native American dream catchers in miniature. There are similar designs at Beit She'arim and the two wonder what they are, for they seem to be at every archway. "I have my own crackpot theory," Stern says. "I think possibly they could be nets to keep the dead in and the bad spirits out." "So they don't come into the settlement?" Boaz asks. "Yes, at first I thought it was protection for the dead," Stern says. "Now, I think you want to keep them inside, so they don't wander about and do bad things." The two archaeologists will return soon to record and continue to research their find. See NPR news for the complete photo slideshow.